Your garden is looking very tropical Dan. Very lush! I see that it is also very sheltered, unlike mine where the wind rattles through almost constantly. I do rather like that exotic looking coleus (?) with the ragged leaves. What is that lovely plant to the right of it? The one with the almost fern-like blue-green leaves? The coleus is ‘Henna’. It’s a cracker. The plant to the right is Dahlia ‘Magenta Star’. In a brighter spot the foliage would be much darker. However it’s still very attractive in dappled shade for part of the day. My garden is very sheltered, but not from every direction unfortunately. It’s particularly vulnerable when the wind comes from the south, as the buildings create a wind tunnel. What I am trying to achieve in my garden is akin to one of those Cornish valley gardens where the air hardly moves and everything grows improbably huge! It really is a cracker. Do you keep it indoors then in winter? And does it need full sun? I bought some coleus this year for the north side of my house. Now wondering if they need sun to retain those colours. In my experience they don’t love full sun, especially if not acclimatised to it. The leaves can fade or scorch. However I am sure the Victorians used coleus in carpet bedding. I am no expert but I would say you’d get stronger colours out of the sun. Apparently over-feeding causes the colours to be weaker too. 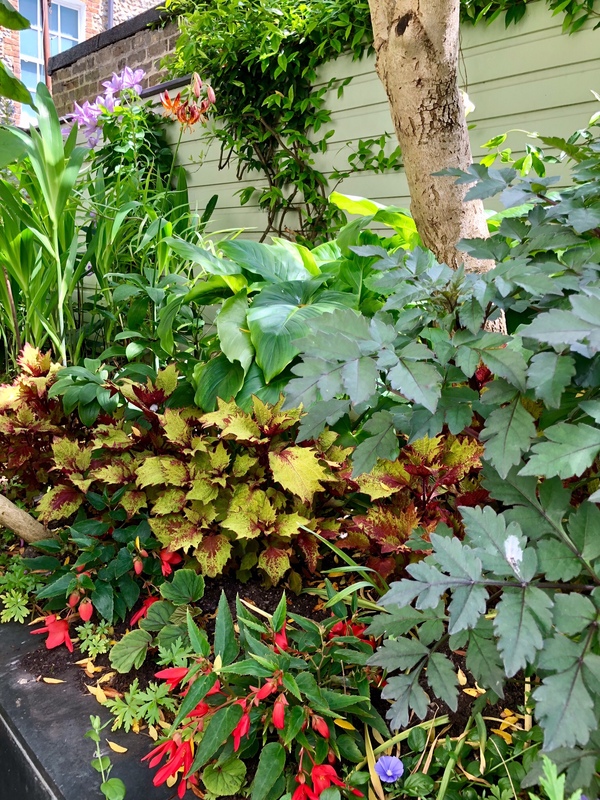 In deep shade you may experience the plants becoming leggy, and I’d be very vigilant when it comes to slugs and snails as they adore coleus. I don’t think any coleus is frost hardy so I take cuttings, root them in water, and keep them indoors over winter if I want to save them …. and I will certainly want to save these! Oh, well. Maybe I’ll keep them as house plants! Hi Julia. Manageable as dry shade is with the appropriate choice of plants, if you can get a soaker hose in there it will extend your options. I resisted irrigation for years and now wonder why I was so stubborn about it. 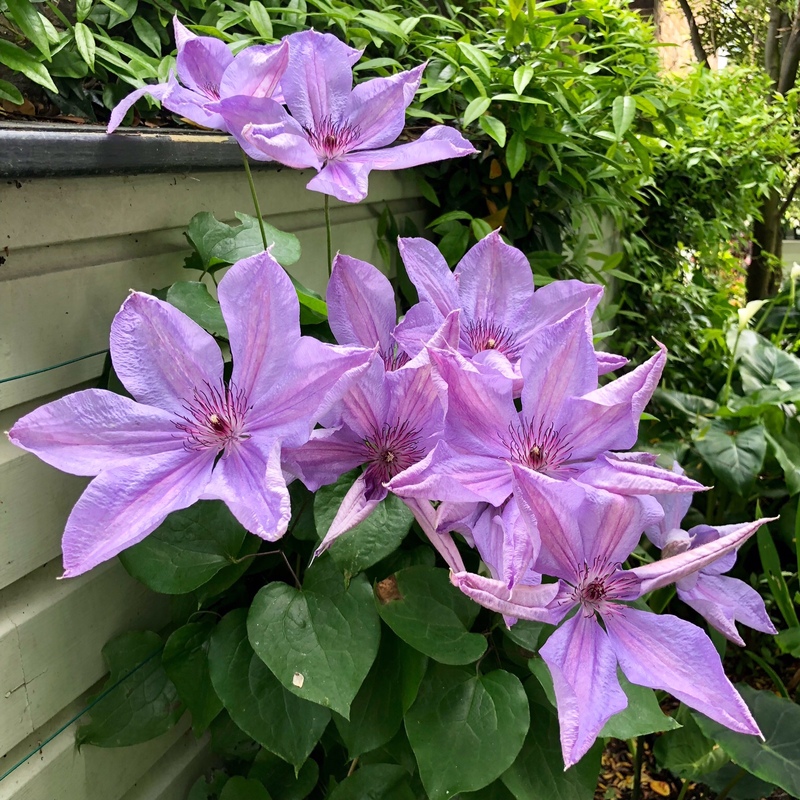 There are lots of clematis suitable for shade, however they all need some moisture, particularly whilst they get their roots down into the ground. Digging in lots of organic matter will help to hold what little moisture there is. I feed mine with fish, blood and bone too. It’s coming along. Starting to require copious watering though. Thank goodness they were unable to install a water meter at my house! A little tropical “Secret Garden” hidden behind the walls. Delightful! It is. My poor carpenter told me that he was asked every 5 minutes what was behind the doors when he was repairing them recently. People will find out if they come back on August 4th and 5th! That is a remarkably recovery. Even without harsh winter, the established portions of the landscape here are not so advanced for this time of year. That’s interesting Tony. I am not sure what it is that makes everything grow so fast in my garden. It’s probably the relative warmth, humidity and shelter. The trees create a microclimate that’s highly conducive to vigour! I love that cozy nook, perfect for coffee and reading! If only! I sat down for about 5 minutes on Sunday when I called my dad for Fathers’ Day, and then I was off again. I can’t be the only gardener that never manages to sit in the garden, surely? Hi- Looks great!-I had the same experience ,but,like you, everything now in full flush! Can you tell me the name of the plant in your first picture with orange foliage [lower centre] Many thanks Robin. Yes I saw them there on Sunday ! Wish I had bought some ! Your garden is lovely. Thank you so much. I am sure they will have some left. Good strong plants. Have grown away unchecked. Funnily enough I have just planted ‘Sweet Summer Love’ which I believe is another hybrid of Clematis ternifolia. It’s a slip of a thing at the moment, but I’m excited to see what it does next year. The flowers are small, violet / magenta and plentiful …. I hope! 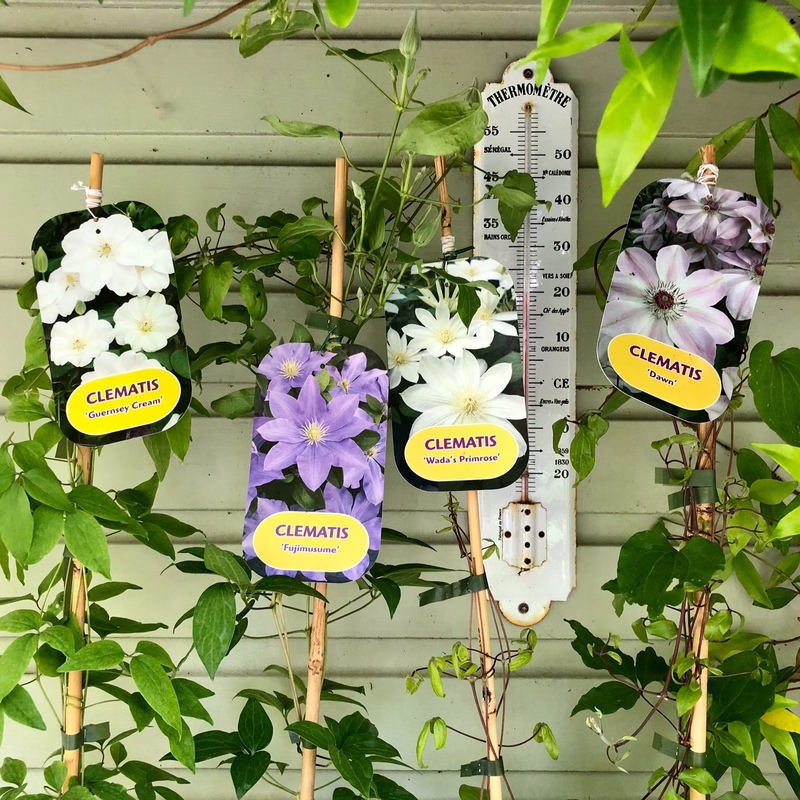 Hi Dan, only got around to reading this now but am very curious as to your experience with Clematis ‘Wada’s Primrose’ in time. It’s been one of the biggest disappointments at mine, flowering very poorly, not repeating and flowers seeming to last hours rather than weeks. ‘The President’ and another white one which I can’t remember the name of right now (too tired, I guess) do so much better only half a metre away from it, same aspect/ position. Would love to learn your verdict one day. Hope you have better luck with it. Lovely to see your garden in recovery. Do you have any other tricks for the vine weevil? I know they are there in my garden because I can see the leaf damage, but this year I haven’t been able to catch them at night. In previous years I’ve caught them easily as they are attracted to the light and gather on the white door frames. Perhaps this year they are hiding because of the heat. No non-chemical tricks other than to be vigilant and go out nightly with a torch. They do seem to be attracted to certain plants, such as lilies, which reduces the search area. I also sweep debris out from between pots as they seem to lurk there at ground level. I think the reality is to control rather than eradicate. I also find that stronger plants are barely troubled by the blighters.